The player is not given a choice of golfers. 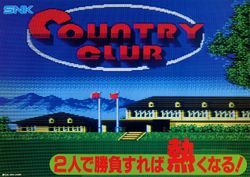 Particular golfing personalities are assigned to the player; Captain Clark for player 1 and Miracle Chosuke for player 2. They are presumably identical in ability. Much of the graphics have been altered, if not generally improved. The controls feature a trackball which must be rolled to determine the strength and direction of the club swing instead of a joystick/button combination. New golf courses provide new challenges. This page was last edited on 23 May 2012, at 23:45.